This description of the Epistle to the Colossians is from Easton's Bible Dictionary. Colossians, Epistle to the: was written by Paul at Rome during his first imprisonment there (Acts 28:16,30), probably in the spring of A.D. 57, or, as some think, 62, and soon after he had written his Epistle to the Ephesians. Like some of his other epistles (e.g., those to Corinth), this seems to have been written in consequence of information which had somehow been conveyed to him of the internal state of the church there (Colossians 1:4-8). Its object was to counteract false teaching. A large part of it is directed against certain speculatists who attempted to combine the doctrines of Oriental mysticism and asceticism with Christianity, thereby promising the disciples the enjoyment of a higher spiritual life and a deeper insight into the world of spirits. Paul argues against such teaching, showing that in Christ Jesus they had all things. He sets forth the majesty of his redemption. The mention of the "new moon" and "sabbath days" (Colossians 2:16) shows also that there were here Judaizing teachers who sought to draw away the disciples from the simplicity of the gospel. Like most of Paul's epistles, this consists of two parts, a doctrinal and a practical. The doctrinal part comprises the first two chapters. His main theme is developed in chapter Colossians 2:1-23. He warns them against being drawn away from Him in whom dwelt all the fullness of the Godhead, and who was the head of all spiritual powers. Christ was the head of the body of which they were members; and if they were truly united to him, what needed they more? The practical part of the epistle (Colossians 3:1-4:18) enforces various duties naturally flowing from the doctrines expounded. 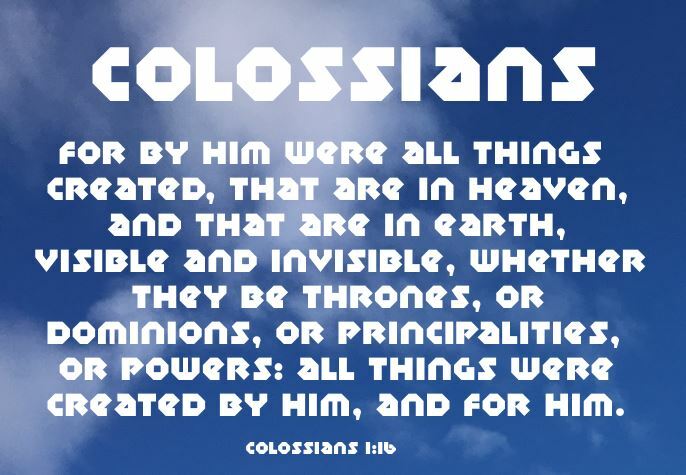 They are exhorted to mind things that are above (Colossians 3:1-4), to mortify every evil principle of their nature, and to put on the new man (Colossians 3:5-14). Many special duties of the Christian life are also insisted upon as the fitting evidence of the Christian character. Tychicus was the bearer of the letter, as he was also of that to the Ephesians and to Philemon, and he would tell them of the state of the apostle (Colossians 4:7-9). After friendly greetings (Colossians 4:10-14), he bids them interchange this letter with that he had sent to the neighbouring church of Laodicea. He then closes this brief but striking epistle with his usual autograph salutation. There is a remarkable resemblance between this epistle and that to the Ephesians (which see). The genuineness of this epistle has not been called in question.